None. 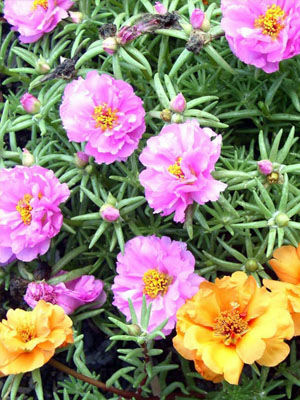 Portulaca is a warm-season flower. Dianthus. Portulaca flowers open during the day, so plant them where they can be seen during midday hours. The low-growing plants are excellent for edging beds or slipping into outer corners. In containers, combine portulaca with taller flowers that like full sun. Start seeds indoors in spring and set out the seedlings after the last frost has passed and the soil is warm. Many gardeners save time by buying portulacas as bedding plants. Portulaca tolerates blazing sun and the delicate blossoms attract honeybees. Colours include red, orange, violet, white and pink. In areas with long summers, portulaca often reseeds itself with seedlings appearing in early summer. Pinch back plants every few weeks to stimulate the growth of new bud-bearing branches. Excessive rain can cause portulaca to develop root rot problems.